The scientific community agrees that a systematic sampling of the full ocean depth is needed to close the planetary budgets of heat and freshwater, and the global sea level budget. The strength and variability of the large-scale ocean circulations that extend from the sea surface to the ocean bottom play significant roles in the uptakes and transports of heat and freshwater, and melting of sea ice. Since the implementation of the Argo program, profiling floats were limited to the top half of the sea (0-2000 m) and the accuracy of sensors was similarly limited to upper ocean levels of temperature and salinity variability. A new generation of autonomous floats called Deep Argo will sample the full ocean volume. Deep Argo float models include the Deep SOLO and Deep APEX capable of reaching 6000 m, and the Deep ARVOR and Deep NINJA designed to sample to 4000 m. Regional Deep Argo arrays in the Southwest Pacific Basin, South Australian Basin, Australian Antarctic Basin, and North Atlantic Ocean are leading the way forward to implement a standing Deep Argo array of 1228 floats. 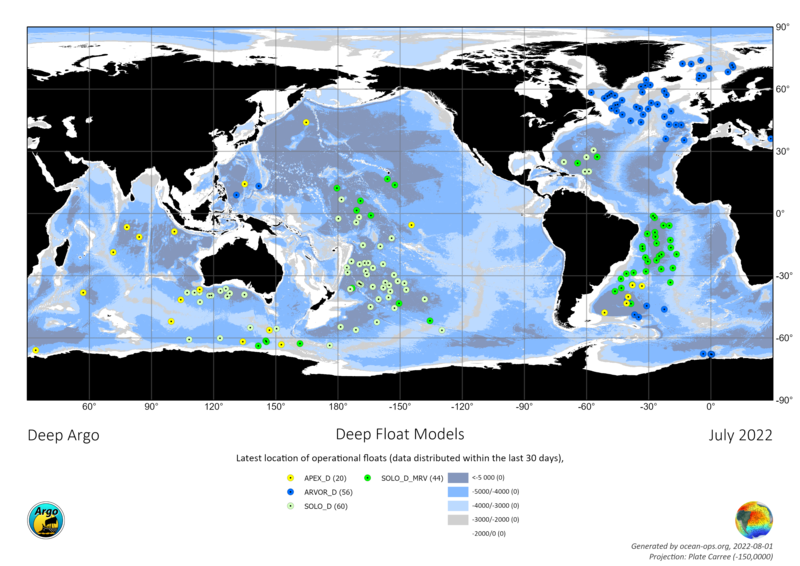 An exciting transition to systematic full-depth global ocean observations is happening. One of the challenges facing Deep Argo is that the CTD sensor used on standard Argo floats was not designed to go below 2000 m depth. Therefore, SeaBird has been working to develop a new CTD sensor that will be accurate down to 6000 m. This new CTD, named the SBE-61, has not yet achieved its aspirational goals of (± .001C, ±.002 psu, and ± 3 dbar) but is progressing relative to those goals.